1) First, make sure that you all of the gigs that you get through GigMasters are confirmed. The client usually does this (when they hire you), but sometimes they forget. If you ever need to book a gig that you've been hired for, you can login, find the gig in your Leads and click Book Now. This must be setup in order for the client can leave you a review after the event. 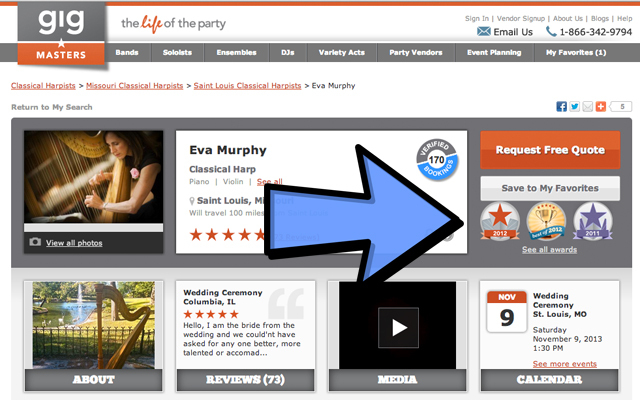 2) Throughout the year you need to earn 5 reviews from events booked through GigMasters. That’s less than one review every two months, so you should be able to pull that off! Hopefully, you'll have many more than that. 3) These reviews must be rated 4 stars or higher by the client. It's rare for clients to rate less than this (unless you have bad gig) but this is just one more reminder to make every gig count! Speaking of GigMasters awards, we also have our Rising Star Awards -- we recently announced our 2012 winners. This award is based entirely on booking revenue earned from GigMasters bookings and only client-initiated gigs count towards the awards. To calculate the winners, we group our performers and vendors by category so that clowns, for example, do not compete against cover bands and wedding tent rentals do not compete against string quartets. Good luck, and we hope to see your name on the winners list later this year!